Men's Celtic Trinity Knot Ring : LOVE2HAVE in the UK! This men's Celtic Trinity Knot ring is the most stunning of all the Trinity rings we sell. 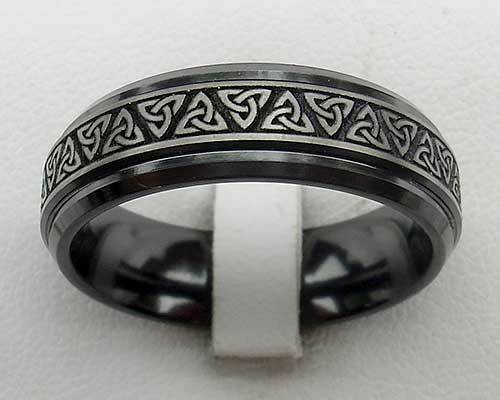 It is a men's zirconium ring featuring the Celtic Trinity Knot symbol. The laser engraved symbol is repeated and reversed on itself in an arrangement that goes all the way around the outer. The patterning is enhanced by the machine lathing away from the black zirconium surface to reveal a very striking two-tone relief. The lathing technique also produces the shoulder cut stepped profiling too. This ring will wear very well for a wedding ring. The designer has advised us that the engraving for this ring takes an hour to complete. The engraved surface itself is quite textured, therefore adding to the ancient Celtic symbolism depicted. The ring's width is 7mm, and it is available in a satin or polished finish.